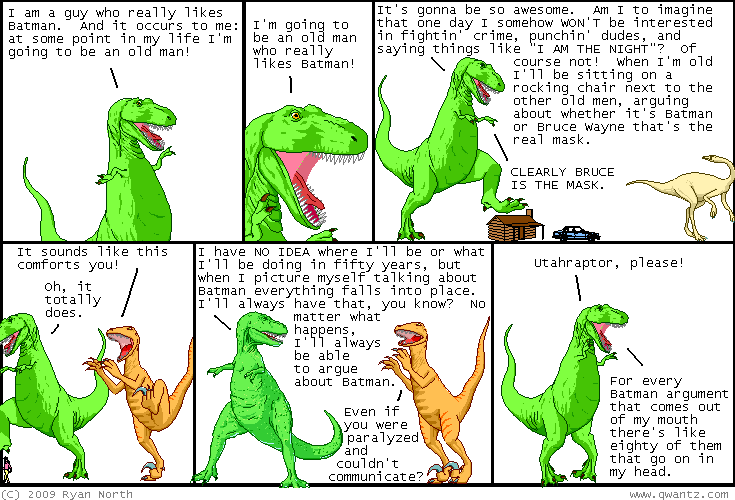 Dinosaur Comics - September 1st, 2009 - awesome fun times! September 1st, 2009: Normally people link to stories like these and say "what could possibly go wrong? ", but I think the idea of reactivating dormant dinosaur traits in chickens leads us more towards a "what could possibly be more totally rad, also, tasty?" response. One year ago today: this is brilliant guerilla marketing. sucky roommates will read this comic, get pissed off at the person who left it there, and think "I'm angry and yet... SOMEHOW - I want to hear more of what these dinosaurs have to say!"